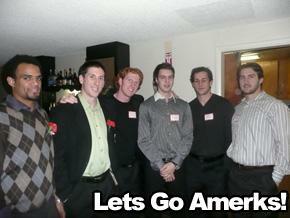 A Night Out With The Amerks · Let's Go Amerks! MondayÂ night was the Rochester American’s Booster Club’s annual Meet the Players Dinner.Â It was a great chance for fans to get to know their home team and have a nice night out. The dinner took place at theÂ Lodge on the Green Party House and was set up nicely with a cocktail hour, dinner,Â meet and greetÂ and dancing with the players.Â The dollar dance was used to raise money for the Booster Club’s Christmas Family. During the dinner every table had one or two players sitting with the fans,Â chatting it up.Â It was nice to get to know a player better.Â I had the pleasure of sitting with Mark Mancari and his girlfriend.Â It was great to be able to ask him what his favorite hockey team was growing up (even if it broke my heart when he said the Toronto Maple Leafs) and see how he likes Rochester (he is a big fan of Wegmans). After dinner, everyone received a nice team picture taken at a practice this year.Â There was a meet and greet where all the players signed the team picture and talked with everyone at the dinner some more. The Booster Club raised a good amount of money with their dollar dance.Â People could pay money to dance with the Amerk of their choice.Â There were plenty of songs so the ladies could dance with multiple players if they wanted to. If you want another chance to meet and greet your Rochester Americans, you can go to the Original Charbroil House on Thursday December 6th at 6:30pm, to see Dylan Hunter and Patrick Kaleta.Â They will mingel and sign autographs for about an hour. The Amerks will be making six apperances at the Original Charbroil House this season. Thursday, January 10 at 6:30 p.m. 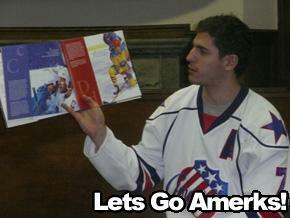 There were also two reading appearances that were changed for the Reading Power Play.Â The appearance that was scheduled for Wednesday, December 19th at the Henrietta LibraryÂ has beenÂ rescheduled because the Amerks are playing in Albany that night.Â It has been changed to Monday, January 7th at 7:00 p.m. The Webster Library Visit was also cancelled.Â It will be rescheduled but, there is no date for it yet.